One of the new collections M.A.C designed for Holiday 2012 is Glamour Daze. The limited-edition collection is inspired by the glamour of getting ready for the holidays, with the shimmer of a festive finishing touch. 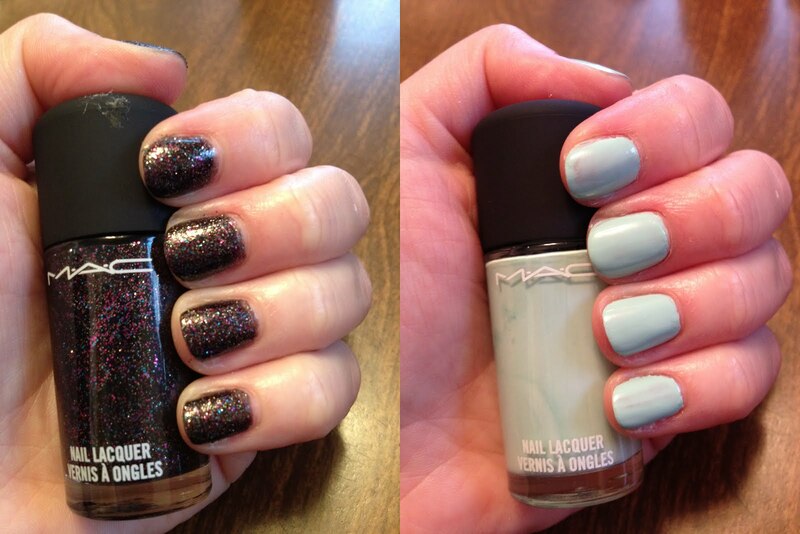 And, of course, I'm obsessed with two of the nail polishes in the collection! Read on for more. In The Limelight is a creamy opaque mint. While I didn't have application issues with it, I will say it applies a bit patchy and streaky, as you can see on my index and pinky fingers. (This is with two coats.) Three coats would even it out completely. I do love the shade, though -- it's in the same vein as M.A.C's Peppermint Patti color from a couple years ago, although this one is much lighter. I would put it in the same color category as Essie Mint Candy Apple, but it has more of a white undertone. Everything That Glitters is a true stunner and one of my favorite nail colors as of late. The black base is shot to life with multitudes of pink, blue and silver glitter. I was worried that it would apply on the clearer side with the glitter sitting haphazardly on the nail, but as you can see, that wasn't the case. It applies easily and evenly, and actually removes quite easily as well. Plus, it just beckons you to keep looking at your nails! This is definitely one for my permanent collection. These two nail polishes retail for $17.50 each at nordstrom.com. OMG!!! Love the color of these nail polishes especially that everything that glitters. It is perfect for this coming holiday season.